In my research, I use a combination of insightful mathematical modelling and careful laboratory experiments to understand the science underpinning a broad range of flow phenomena in industrial and environmental fluid mechanics. Mathematical modelling is carried out either analytically or numerically, depending how far progress can be made using pencil and paper. The experiments are conducted in the well-equiped laboratory of the Manchester Centre for Nonlinear Dynamics at the University of Manchester. - One of my research topics is related to the complex physics and chemistry of ﻿cleaning and decontamination processes at surfaces.﻿ This multidisciplinary project with profound research questions at the border between fluid mechanics, physics and chemistry has also very practical applications: cleaning in dishwashers or the decontamination of toxic chemical substances. - In another research topic, I investigate the transport, dispersion and mixing properties of turbulent flows such as jets, plumes and fountains. Applications range from large geophysical flows such as volcanic eruptions to industrial processes in chemical reactors, or oil refinement, as well as mechanical ventilation or even oil spills in the ocean. - In a more recent project, I analyse the impact of surfactant on the performance of superhydrophobic surfaces for drag reduction purposes. This is applicable to both internal flows, such as pumping of oil or other fluids in pipes, as well as external flows, such as reducing the drag of a submarine or a ship. Cleaning and decontamination processes at surfaces can use mechanical forces to remove alien materials on a surface. However, these can lead to high consumption in water, detergents and energy. In this project we investigate a more environmentally friendly process, which relies on a slow dissolution process. As shown in the schematic on the right, we investigate the physical and chemical processes involved when a thin film of water (which can contain other cleaning chemicals) flows over a droplet representing a soiling substance. Through analytical, numerical and experimental investigation, we have found how the mass transfer or cleaning rate evolves depending on the Péclet number in the film, as well as the Péclet number in the drop. Left: gravity-driven film flow over a droplet (blue) to start a convective mass transfer at surface. Right: typical profile of advection-diffusion boundary layer found above a drop in a shear flow. Collaborators: Merlin Etzold, Stuart Dalziel (DAMTP, University of Cambridge), Henry McEvoy (Dstl). Superhydrophobic surfaces (SHSs) have the property of repelling water from their surface to an astonishing degree. Known in nature as the ‘lotus leaf effect’, water rolls on the lotus leaf as near-perfect beads, instead of spreading over the leaf. Owing to a combination of micro-texture and chemistry, water droplets mostly stand above air bubbles trapped in the micro-texture. This is known as the Cassie-Baxter or fakir state! This observation has recently inspired scientists to cover the external surface of ships, submarines or the internal surface of pipelines with SHSs in order to decrease their drag. As drag or friction between air and water is significantly less than between water and solid, SHSs have the potential to reduce considerably the energy used in maritime transport or pipe flows. However, laboratory experiments conducted in the past ten years have found inconsistent results, with many studies reporting significantly decreased performance compared with theoretical and numerical predictions. With collaborators from the University of Cambridge and the University of California Santa-Barbara, we have recently proposed that surfactants, organic molecules naturally present in our environment, are the most likely cause for the decreased performance of SHSs. This was found after two years of intensive research, using careful experimentation with confocal microscopy, numerical simulations and mathematical modelling. As even minute concentrations of surfactants can severely reduce the SHS performance, the impact of our discovery is important for many applications and could guide the design of future SHSs. Collaborators: François Peaudecerf, Ray Goldstein (DAMTP, University of Cambridge), Paolo Luzzatto-Fegiz, Fernando Temprano-Coleto and Frédéric Gibou (UCSB). In the event of an oil leak at the bottom of the ocean, a multiphase hydrocarbon plume rises through the ocean layer, and then forms an oil slick at the surface (see top picture). In 2010, the accident that destroyed the Deep Water Horizon platform in the Gulf of Mexico, led to the largest oil spill in deep seas (1260 m depth). The consequences of the oil spill were disastrous for the environment and the local economies along the Gulf affected by the oil spill. As part of the Consortium for Advanced Research on the Transport of Hydrocarbon in the Environment (CARTHE), we study the physics of the oil plume as it rises from the bottom of the ocean to the surface. The turbulent plume is constituted of different phases: oil droplets, gas bubbles, water and potentially some dispersant. One of the key factor determining the quantity of oil and gas reaching the surface, and subsequently the impact of the oil spill, is related to the dilution of the plume by entrainment of sea water. A turbulent plume entrains ambient water through a complex turbulent process. 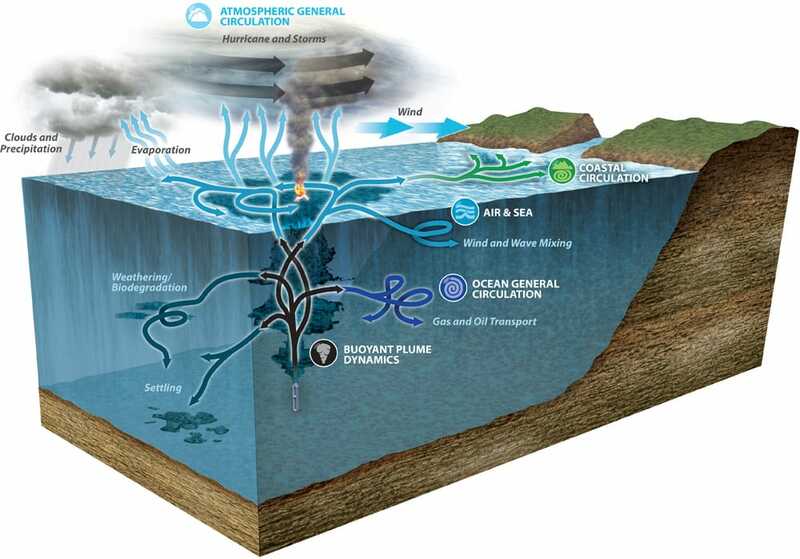 In the case of an oil plume rising in the ocean, the plume dynamics is affected by multiple environmental factors, such as: the stratification of the ocean, the presence of currents, the Earth rotation, the use of dispersant, the physical and chemical properties of the oil and gas mixture. Since 2015, we have conducted experiments in the GK Batchelor Laboratory at DAMTP, University of Cambridge, to understand the impact of these factors on the plume dynamics. In particular, the experiments conducted by Daria Frank have shown that the Earth rotation can induce a precession of large scale plumes in a homogeneous environment (see bottom picture). This precession can lead to enhanced dispersion of the plume in the environment, thus increasing the dilution of the plume. Our results suggest that this precession could occur for ash clouds from long volcanic eruption or oil plumes from a deep water oil leak, such as the Deep Water Horizon 2010 oil leak. Collaborators: Daria Frank, Stuart Dalziel and Paul Linden (DAMTP, University of Cambridge). - See also interview by Tom Rocks Maths and FYFD: YouTube video. The study of quasi-two-dimensional turbulent jets is relevant to chemical reactors, the coking process in oil refinement, as well as shallow rivers flowing into lakes or oceans. In the event of a spillage of pollutants into a river, it is critical to understand how these agents disperse with the flow in order to assess damage to the environment. For such flows, characteristic streamwise and cross-stream dimensions can be much larger than the fluid-layer thickness, and so the flow develops in a confined environment. When the distance away from the discharge location is larger than ten times the fluid-layer thickness, the flow is referred to as a quasi-two-dimensional jet. From experimental observations using dyed jets (see top right fig.) and particle image velocimetry (see bottom right fig. ), we find that the structure of a quasi-two-dimensional jet consists of a high-speed mean- dering core with large counter-rotating eddies developing on alternate sides of the core. The core and eddy structure is self-similar with distance from the discharge location. The Gaussianity of the cross-stream distribution of the time-averaged velocity is due, in part, to the sinuous instability of the core. Resolving analytically the advection-diffusion equation in the flow, we found that if a finite quantity of pollutants is spilled in the river, more than 50% will travel faster and farther due to the strong dispersive interaction of the eddies and the sinuous core. 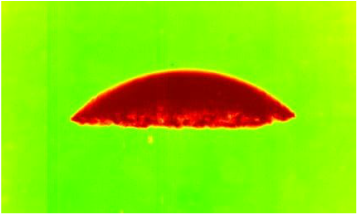 Pictures of a steady quasi-two-dimensional turbulent jet revealed by dye injection. Sinuous instability of a confined jet. Left: Passive tracers (shown as streaks) in a confined turbulent momentum jet; middle: corresponding velocity field (arrows) and vorticity field (background) measured using particle image velocimetry; right: schematic of the self-similar unstable sinuous core and alternating side vortices. Collaborators: Colm Caulfield (BPI and DAMTP, University of Cambridge), Andy Woods (BPI, University of Cambridge). Impininging jets are important in many industrial cleaning processes, whether performed manually or using a cleaning in place system. In our daily life, dishwashers use impinging jets to clean the surface of dishes, plates and cutleries. It is also a well-known daily preoccupation of half of the world's population! To clean efficiently it is important to understand how the velocity and the shear stresses evolve in the flow. As can be seen in the two pictures on the left, showing an impinging jet at low impact speed (top) and one at high speed (bottom), there are different regions in the flow. Close to the impinging point, a thin layer of very high speed radial flow exists. In this region, the flow has intense shear and soil on the surface can be removed through mechanical forces. The limit of this region is characterised by a film jump. Beyond the radial flow zone, flow at the top is pulled down by gravity and forms thick ropes at the edge of the draining flow region. In the interior of the draining flow region, the film is relatively thin. Our PIV measurements show a uniform velocity profile in this region. As can be seen in the figures, the film surface is very unstable to long waves, which are two-dimensional at low speed and three-dimensional at high speed. In the draining region, cleaning of soil attached to the surface is not performed mechanically due to the low shear. Instead, a slower dissolution process can occur. If soap is used, detachment of soil can also occur by changes in the adhesion properties. Jet impinging on a vertical surface at low Reynolds number (front view). Jet impinging on a vertical surface at high Reynolds number (front view). Collaborators: John Davidson, Ian Wilson (CEB, University of Cambridge), Stuart Dalziel (DAMTP, University of Cambridge). How big can air bubbles in water be? How fast do these large bubbles rise? These were the questions that motivated this experimental study, which eventually led to the discovery of a new kind of bubble. Our study was motivated by issues arising from the sequestration of carbon dioxide, one of the main greenhouse gas, in underground reservoirs at the bottom of the ocean. In case of a leak of carbon dioxide (CO2), we need to know the size of the fastest bubbles which can form, in order to determine whether the bubble will reach the ocean surface before its gas is entirely dissolved in the water or not. The latter being undesirable as effectively releasing the CO2 into the atmosphere. In experiments conducted at the GK Batchelor Laboratory (DAMTP, University of Cambridge), we found that under some circumstances, releasing a large volume of air in water could lead to two very different kinds of bubbles. The first kind is the well-known spherical cap bubble, with a top spherical part and flat bottom (see figure on the top right). 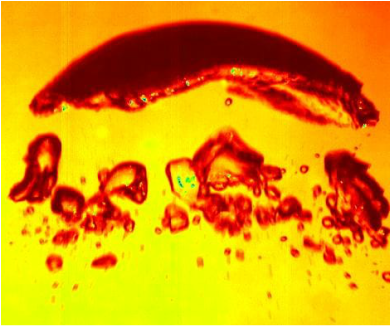 The second kind corresponds to a multi-part bubble, with a large lenticular bubble on top, and a crown of smaller bubbles trapped in its wake (see figure at the bottom right). The most surprising discovery about the second bubble, or crowned cap bubble, is that for the same total volume of air, the crowned cap bubble rises 5% faster than the spherical cap bubble. It had always been assumed that the air volume of large bubbles was the main parameter determining their speed. Here we found that through a different organisation of the air, the bubble can decrease its drag and therefore rise slightly faster. Spherical cap bubble (base diameter: 10 cm). Crowned cap bubble: a multipart bubbles with a large lenticular bubble on top (base diameter: 15 cm) and a toroidal crown of smaller bubbles in its wake. Collaborators: Carlo Cossu (CNRS, École polytechnique), Colm Caulfield (BPI and DAMTP, University of Cambridge). Ref: Landel, J. R., Cossu, C., Caulfield, C. P. "Spherical cap bubbles with a toroidal bubbly wake". Physics of Fluids 20: 122101. doi (pdf) Paper in the Physics of Fluids top 20 (Dec 2008, Jan 2009).